to Capture the sun for you. 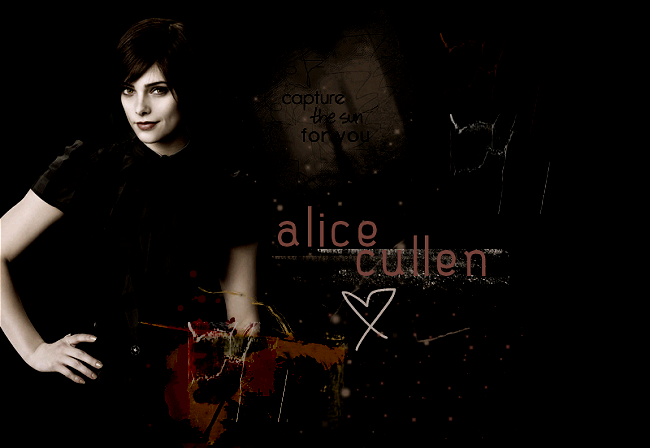 This is the TFL-listed & TML-listed Fanlisting for the awesome character, Alice Cullen from the Twilight series of books by Stephenie Meyer and the movies based on them. If you're an Alice fan, as well, get listed as one! "And speaking of Italy and sports cars that I stole there, you still owe me a yellow Porsche." We opened on July 1, 2010, after I adopted the fanlisting from Sarah. The last update was on April 08, 2019. There are currently 513 fans listed, and 0 is/are waiting to be added. Welcome, Line. This site is maintained by Tiffany & is hosted through Surpass Hosting. The images used in the making of this site came from the official Twilight Saga website and belong to their respective owners. No infringement is intended, this is purely a fan effort & nothing more.